Summer has been a real pearler so far, but most makeup is no match for this heat and humidity. Editor Trudi Brewer shares two new products from Shiseido that are so good, you can even wear them to the beach. Summer is great for the soul, but punishing on the skin, so when I get the opportunity to try new SPF makeup I jump at the chance. Shiseido’s latest innovation is designed for active types who love to be outside and want to look good while protecting their skin. The brand has launched two new tinted and transfer-resistant products which promise to protect skin from harmful UV rays while refining your complexion and keeping it shine-free. Available in a liquid format, BB for Sports SPF50+, or powder, HydroBB Compact for Sports, they are the ideal makeup solution for when the mercury rises. Here's how they work. Both products contain Shiseido’s innovative WetForce technology, which improves the SPF50+ effect when it comes into contact with sweat or water, in addition to Quick Dry technology to mop up perspiration. These combine with a complex the brand calls Super-Veil-UV 360 and contouring powders to provide superior sun protection and an even-looking complexion. The lightweight, non-comedogenic formulas won’t clog pores and feel like you’re not wearing any makeup at all. The Quick Dry technology wicks perspiration away from the surface of the skin, helping to maintain a shine-free complexion and prevent breakouts and congestion. The addition of amino acids keeps skin well hydrated and those smart contouring powders offer a three-dimensional shield that gives skin a flawless finish under the hot sun. Makeup and the beach has never been a winning combination for me. I tend to wear a tinted sunscreen, which is exactly what these products offer. The compact is convenient to keep in your bag for touch-ups when you’re on the go at the beach or the bach, while the liquid is the perfect lightweight base to wear to work when teamed with under-eye concealer and a little bronzer. I love the fact both products come in five flattering shades, offer high-tech UV protection and a sweat-proof barrier – perfect for our hot, steamy summer. 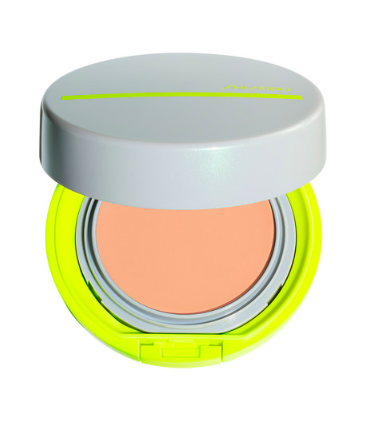 Shiseido HydroBB Compact for Sports, $60, refill costs $18. 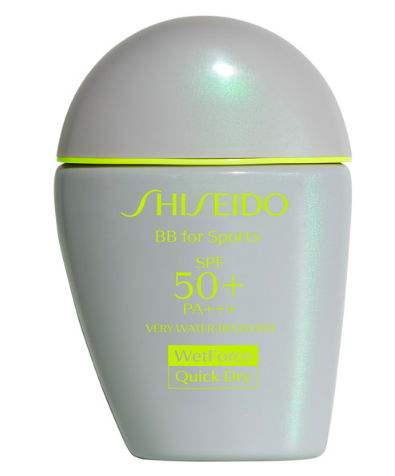 Shiseido BB for Sports SPF50+, $60.